Partnering with Paramount Pictures, Sonic debuts new Transformers: The Last Knight Slushes to as part of the lead-up to the upcoming release of the movie on June 21, 2017. The new, limited-time slushes come in three flavors each inspired by a Transformer from the movie. 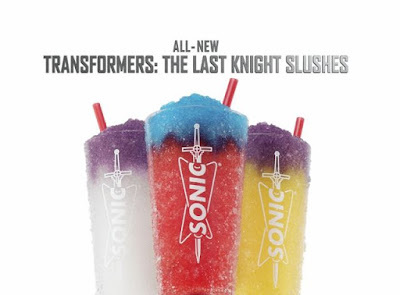 There's the Optimus Prime Slush, the Megatron Slush, and the Bumblebee Slush. Each comes in a movie-theme clear cup so you can better see the color change in action. The color changing starts when you stir the drinks. The Optimus Prime Slush features a cherry Slush with a top layer of blue raspberry flavor. The Megatron Slush is a sweet, clear Slush with a top layer of grape flavor. Finally, the Bumblebee Slush consists of a orange Slush topped with a layer of grape flavor.